Will your insurance pay your claim if you are negligent? Negligence is a failure to act in a way that a reasonable person would when faced with the same situation and circumstances. In insurance, the policyholder might be negligent, or it might be another party. Negligence pertains to all types of insurance: home, life, health, and auto. Depending on the level of negligence and the type of damage, your insurance policy might still pay a claim if it occurs because of your negligence. In cases of liability, the insurance company will typically pay for your legal defense, but it may not pay for subsequent damages if you lose. Negligence is a case-by-case assessment, so you should always do whatever seems reasonable to protect your property and that of others. When Might You Be Considered Negligent? If water is coming into your home due to a burst pipe, your insurance policy most likely requires that you do something to try to prevent further damage. That's what a reasonable person would do. If you decide not to for some reason, it could be considered negligence on your part. The initial damage might be covered, but excessive damage because you didn't act would most likely be brought into question – at least unless there were extenuating circumstances. Maybe you weren't at home at the time the pipe burst, or perhaps there was electrical wiring in the location where the water was coming in so you couldn't safely approach it to take action. The insurance company wouldn't consider it negligent if you decided to wait for qualified help. Respect the terms of your contract and take reasonable measures to protect against further damage whenever possible, but don't put yourself in danger. It doesn't necessarily mean you're in the clear just because your insurance company pays a claim. Insurers are in the business of managing risks, and they try to choose and retain policyholders who will minimize risk. When someone is clearly negligent or has repeated incidents of claims that could have been prevented, an insurance underwriter might decide to cancel his policy. The policyholder might be forced to go with a high-risk company because no one else will insure him. It invariably means higher premiums, so it's better to be cautious than risk significant or repeated claims that you might have been able to avoid. Jennifer has her trees cut back and maintained every year, but one of her trees fell on her neighbor's home during a storm regardless. It caused extensive damage. The neighbor accused Jennifer of negligence, but she had documents to prove that she had taken reasonable measures to maintain her property. Although it was her tree that fell, it didn't happen due to her negligence. Bricks were starting to crumble off the side of John's home. He was too busy to worry about it, and the situation continued for several months until several bricks fell to the ground near the sidewalk. John never got around to picking them up, and someone tripped over them and fell, breaking his leg. The individual threatened to sue John for his medical expenses. 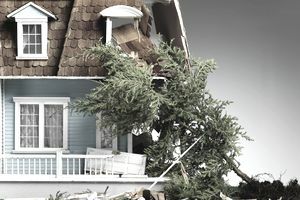 Although John was clearly negligent, his home insurance policy might still help him out in two ways, making voluntary medical payments if the amount was within the limits of the policy, or from the liability portion of the home insurance policy. Stephanie's mother passed away, and Stephanie inherited her house. The home sat vacant while Stephanie settled the estate, an often time-consuming process. She got a vacancy permit and promised the insurance company that she would visit the house every four days until she could move in. She also stated that she would have someone maintain the property. However, Stephanie was so busy and distracted by her loss that she never found someone to look after the house as she had promised. She didn't call the insurance company to let them know. Five weeks later, Stephanie went to the home and discovered major damage. Her claim was denied due to her negligence for not having advised the company when the situation changed from their original agreement. Anna noticed a funny smell coming from her attic. When she finally went upstairs to check it out, she discovered water dripping in the walls. She called her insurance company to make a claim. They opened the walls and found mold. Anna had water damage coverage, but her claim was denied because insurance isn't intended to repair maintenance issues. The gradual damage caused by the water, including the mold, was not covered. Anna ended up paying a lot of money to repair the problem because her insurance company took the position that it was her negligence as a homeowner that resulted in the damage – she didn't maintain her property. Even worse, Anna was advised by the insurance company that she had to repair the damage, or they would cancel her policy. Nancy backed out of her driveway without looking up and down her street first because there was never any traffic there. She hit another car. The accident was Nancy's fault because she was negligent, but the insurance company would still pay resulting claims because she carried full coverage – liability coverage to address her actions and collision coverage to deal with the damage to her own car. When it comes to insurance negligence, the key word is "reasonable." If you're ever in doubt, ask yourself what most people would do in your situation. Would they pick up those bricks falling off the house? Would they investigate a funny smell coming from the attic? If your answer is yes, do the same and negligence should not be an issue.